"A must read! A truly unique reading experience." "Published in a large hardcover format this unique title should find an audience. Should be popular with manga fans." 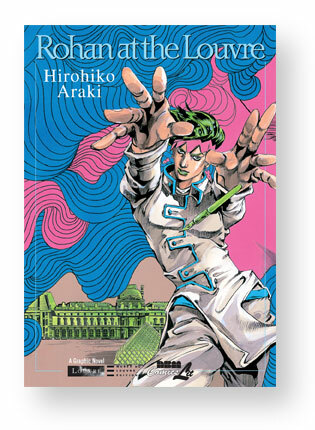 "Araki’s book will be relished by readers who are fans of the manga format, especially those interested in art." "A must read! With its attention to the artistic process and the almost INDIANA JONESesque mystery of an ancient relic, mixed with a little bit of Japanese fairy tale whimsy, ROHAN AT THE LOUVRE is a truly unique reading experience." "A neat comic, a nice chance to see manga art in color, which is a rarity, at least for work that has been translated into English. It also seems like a good sample of Araki's work, something that might point readers toward his other stuff." "Rohan at the Louvre belongs on everyone’s shelf! This book has rocketed to the top of my "Best of" list for the year." "Araki’s style is flamboyant and flashy, an interesting merger between traditional Japanese linework and American slickness." "It’s a straightforward, beautifully drawn, and delicately colored tale, filled with emotional bursts, sudden death, and the scent of eternity. It’s also a great deal of fun." "Looking like the work of a Japanese P. Craig Russell, Araki’s art lends a wistful mood to the tale’s proceedings and arrests the eye with willowy figures and expressive faces. Previous volumes of this graphic novel series published by the Louvre itself have all been excellent, and this is no exception." "One of 12 books to look forward to in 2012"